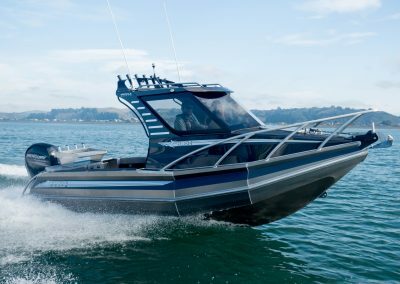 The pontoons give the hull stability, while the 18-degree deadrise, rising sheerline and the tapering of the pontoons toward the bow avoid hammering, yet retain plenty of lift in the nose. The three pontoon chambers and sealed under-deck section provide significant reserve buoyancy and give plenty of that valuable commodity – peace of mind. 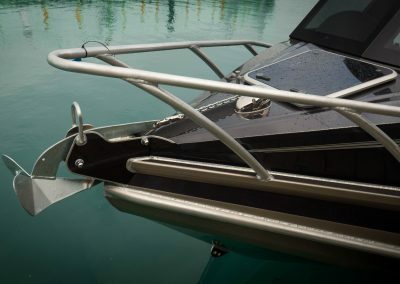 The pontoons are constructed from 3mm aluminium and are protected by a fending rail. The hull has a 5mm bottom. Recommended power ranges from 115-175hp. For those wanting a manual anchoring system, the best option is to work through the hatch in the cabin roof, which has a treadplate platform in the front of the cabin for the bowman to stand on. 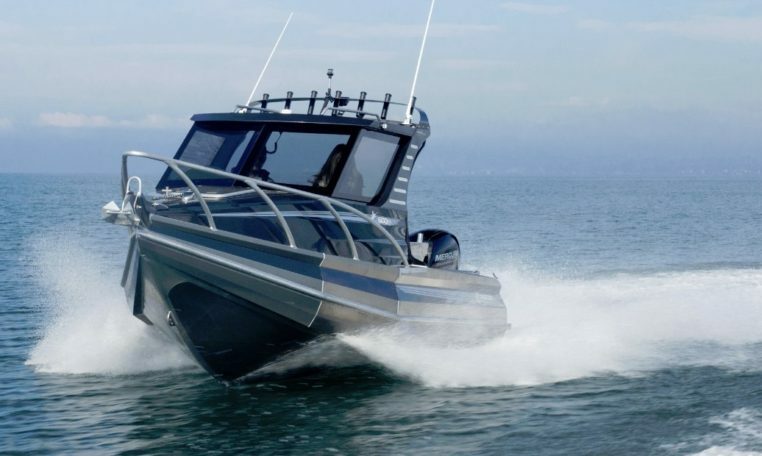 The bow can also be reached around the cabin sides; non-skid panels and substantial bow rails help increase security. There is a crucifix bollard for tie-off duties. The open-entry fore-cabin was set up as a day boat, with seats providing stowage space underneath, along with deep side shelves. Options such as berth in-fills and extended berths and toilet are available. The large polycarbonate roof hatch lets in plenty of light and a hinged swing door gives access into the console’s rear. Sealed treadplate decking runs from the bow to the transom. Between the helm seats is an under-deck kill tank with a flush hinge for the hatch, which can be drained via a pipe to the stern of the boat. The decks drain to a sump under the transom wall which is, in turn, drained by a 1100gph bilge pump. 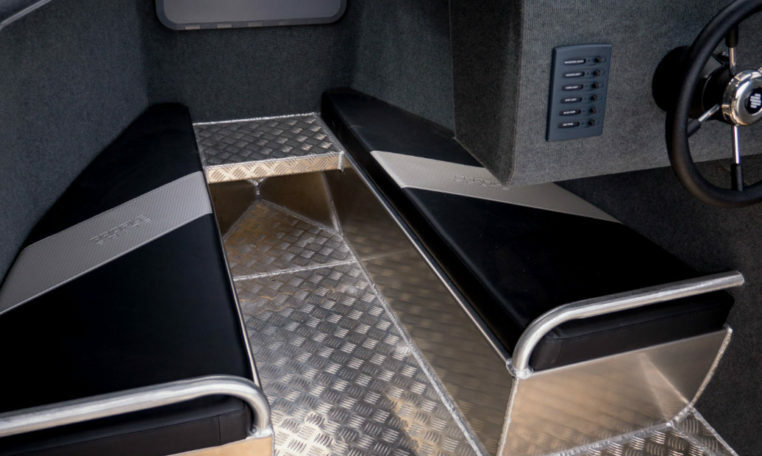 The helm seats themselves are upholstered plastic bucket seats on Softrider pedestals with swivel, slide and height adjustments, but other seating options are also available. All-around visibility is good through fixed toughened glass windows, and a decent-sized dash has a rear lip, is lined with dark marine carpet, and is fitted with a passenger grab rail. 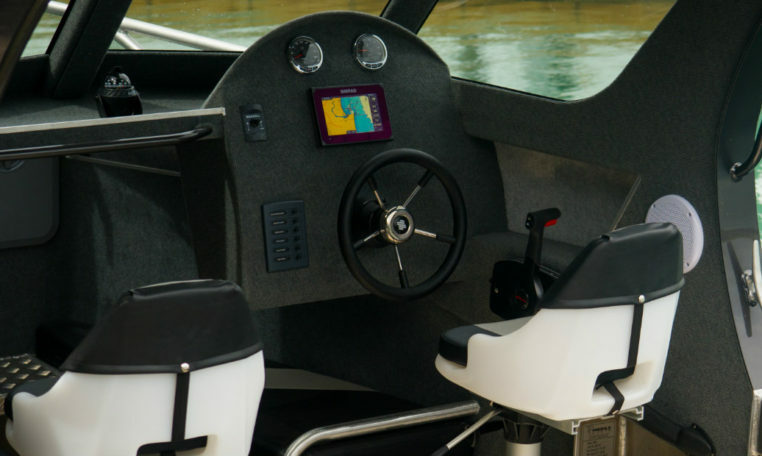 The helm console has a raised curved top, and instruments, switching, capstan controls and electronics are all flush mounted. The Ultraflex hydraulic steering features a nice ‘destroyer-type’ wheel, and the Mercury cable throttle-shift is positive and smooth. A Lowrance Link 5 VHF and Fusion sound system are fitted overhead, as are LED cabin lights and twin grab rails. Cabin and hardtop are lined to the deck with marine carpet. 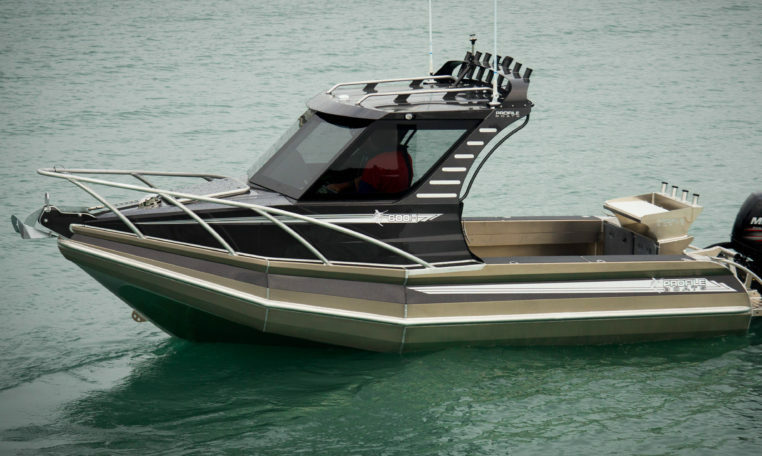 The hardtop extends back to offer good shelter to the helm seats and also mounts a cockpit floodlight, rocket launcher, more grab rails around the trailing edges, and ‘midships tie-off cleats. The layout has been configured to provide maximum workspace in the cockpit. 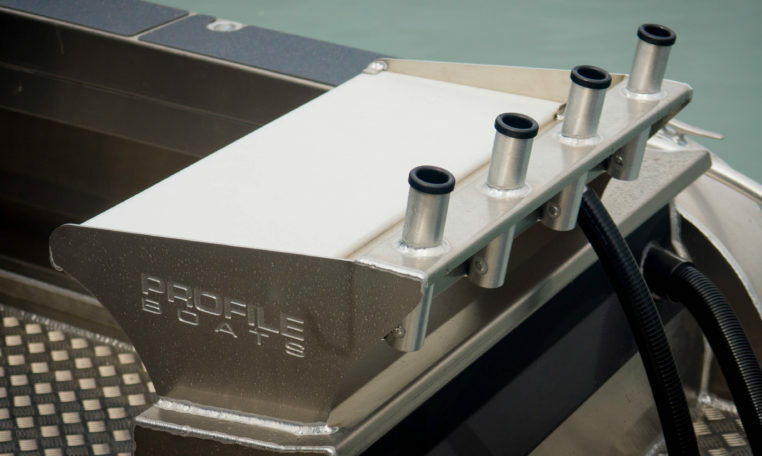 The pontoons form wide, flat gunwale tops covered by Octogrip panels which prevent your rear-end getting scorched or frozen, depending on the season. The deck is flat for the whole width, with no hull plates exposed. There are shelves along the sides that look wide enough to take dive bottles, as well as gaffs, poles, rods etc. The transom wall features a step-through with drop door on the port side. The remainder is taken up by a locker that houses the twin batteries, fuel filter, isolation switch etc. The fuel port is on the outside of the transom (keeping any spillage out of the boat) and a rail guards the fuel lines and twin breathers where they pass from the transom locker through to the deck. The rear of the transom wall features a back-curved wave deflector at the top, increasing the boat’s usefulness in the surf. The curved Portofino stern supports a treadplate boarding platform, and both sides are fitted with cleats and grab rails. There’s a ‘T’-type fold-down boarding ladder on the port side (adjacent to the transom step-through). Divers prefer this style of ladder over the ‘H’ type as it is easier to use when wearing fins. The water intakes, transducer, etc are mounted below the platform. 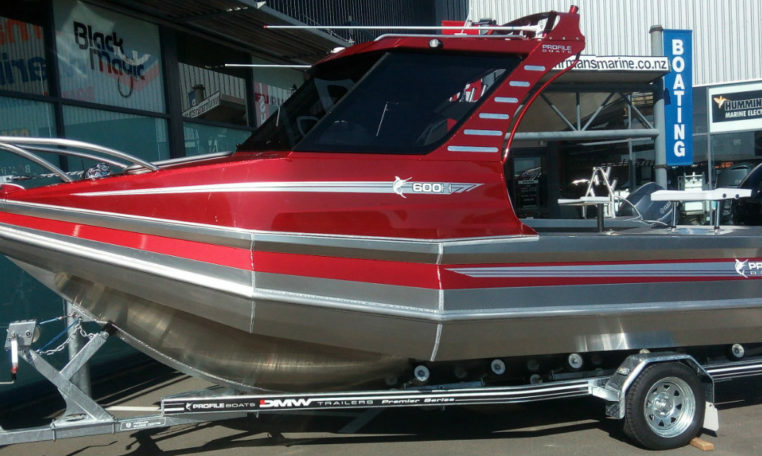 Although the 600H can be turned to many purposes, fishing and diving are the main thrusts. 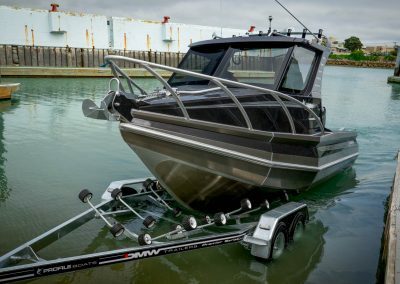 The pontoons and transom turn-back make it useful for beach launching, and this is an advantage when there are few formal boat-launching ramps in isolated spots. 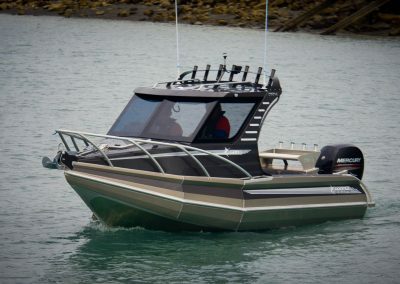 The pontoons also add to the hull’s stability, which was greatly appreciated while fishing in the test day’s sloppy conditions, aided by the treadplate deck’s good footing. Fishing fittings include three through-gunwale rod holders along each side; a seven-position rocket launcher on the hard-top; and a further four holders on the fixed bait station on the transom, for a total of 18 positions. The bait station also features a rear gutter with overboard drainage and a good-sized cutting board that is removable for cleaning. At the end of the day, Brian Firman and I could work side by side, filleting the catch without stabbing each other. The plumbed live-bait tank under the transom step-through has a top hatch with recessed hinges and a viewing window. 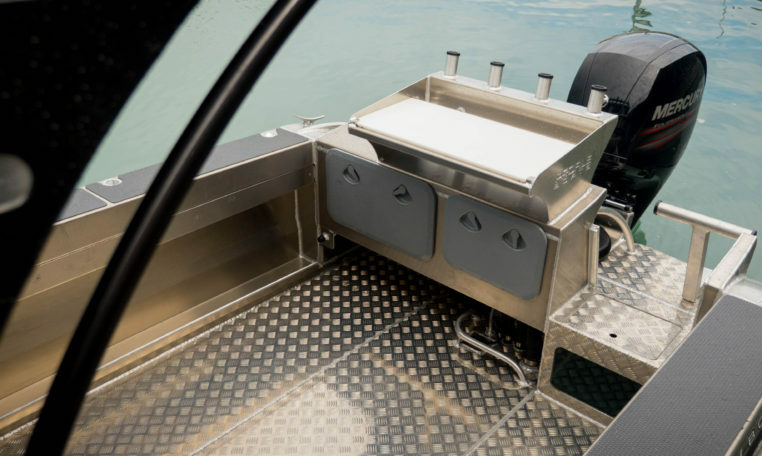 The 600H was set up as an uncomplicated fish-and-dive boat with maximum workspace, preserving its flexibility. It is robustly built, offshore-capable, towable and handles the rough well. 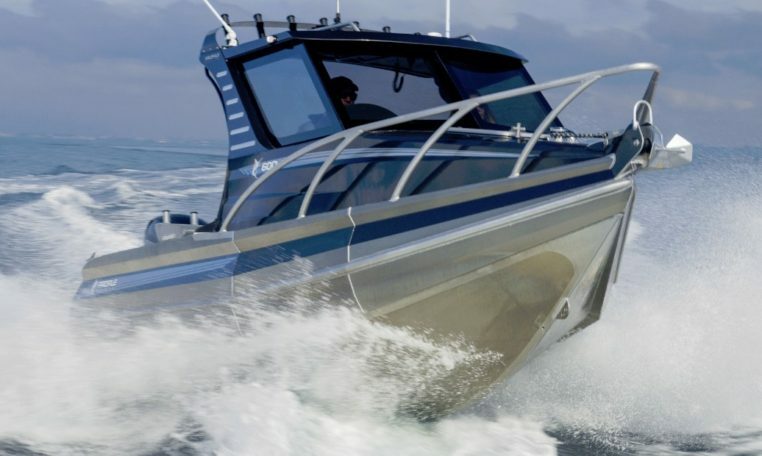 It combines the desirable safety, stability and load-carrying features provided by the pontoon configuration with the weather protection of a hardtop. 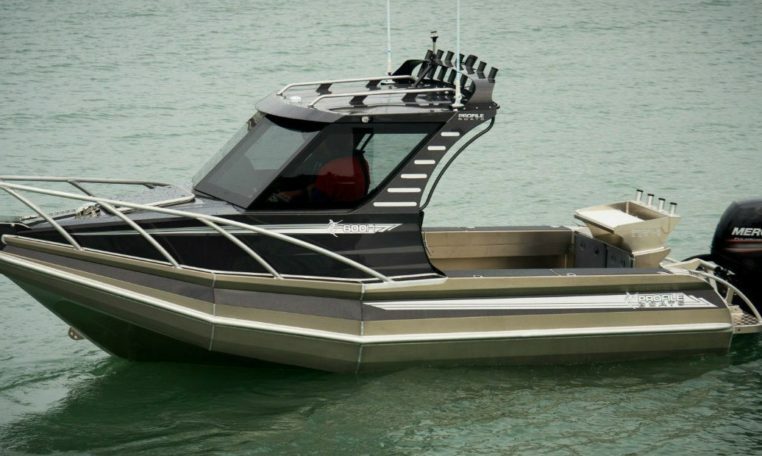 The pontoons taper to the bow and, added to the rising sheerline, give the rig a classy but no-nonsense feel. Tow weight is around 1550kg.